Indian wedding traditions are extravagant and lavish and it’s considered to be very holy and sacred. The traditions differ according to the cast, region and culture but the basic thing is the same. It celebrates the union of the two souls. The rituals are different for different communities but there are similarities. Indian wedding ceremony starts much before the wedding. There are pre wedding ceremonies as well as post wedding ones. Thus an Indian wedding ceremony often lasts for several days. It starts from the engagement where the bride and groom exchanges rings, gifts, sweets etc. The engagement can be held some days before the wedding, as well as months before. Then there is sangeet which is the musical function. During this ceremony all the members of both the families gather together, to celebrate the upcoming wedding. It’s a ceremony where everyone sings and dances to wedding songs. It’s usually organized by the groom’s family. After Sangeet there is mehendi, the Hindi term for henna. In other words it’s the henna ceremony, where all the ladies of both families as well as the groom gets henna applied to their hands. It makes the hands beautiful as well as it’s considered to be pure. 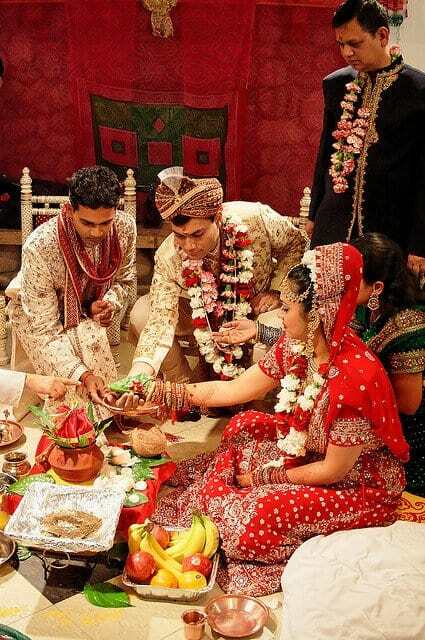 Then on the day of the wedding the haldi ceremony is held. It is also held at both bride as well as groom’s place and it’s one of the most common Indian wedding traditions. Haldi or turmeric is considered to be pure and it has cleansing properties as well as it’s believed to add beauty and bring glow to the skin. The puja – It’s the prayer offered at both the houses before the big day, as well as on the wedding day. It’s done to take the blessings of the higher power, before the bride and the groom marks the beginning of their journey together as a couple. It’s done in almost every culture just the methods and rituals changes. The hawan – Fire is considered to be very sacred in Indian culture. Hawan is a pit of fire right in the center of the mandap or the center stage. Most of the rituals take place around the havan kund. In some culture havan is not done instead a diya or the holy lamp is placed in the center of the mandap. The barat – It’s the arrival of the groom with his family and friends. Marriages are nothing less than a festival in Indian wedding traditions. The barat come with dance and music procession. They are greeted by the bride’s mother and other family members, at the door of their home or venue with garland and aarti to welcome the groom. Then there is the saat phere or the seven vows which is taken by the bride and the groom. There is significance to each circle that the couple has to take around the havan kund. The first one is the pledge taken that they would have a healthy and prosperous living. In the second one the couple asks for spiritual, mental and physical peace from god. In the third phera the couples asks for wealth and earn a living by good means. The fourth vow is taken to maintain love and respect for each other and their families. The fifth wow is a bit futuristic, it’s about having children whom they will provide all the love and support needed. The sixth one is for leading a peaceful life together and they pray for the longevity of their relationship. The final vow is a promise for togetherness, commitment and understanding for each other. In some cultures only three pheras are taken, while in other all seven pheras are taken. Ultimately the ritual is basically a pledge taken by the couple to lead a happy and fulfilling life together. After the phera comes the kanya daan, which means giving away the daughter or gift of daughter. It’s a ritual that is present almost in every traditional Hindu wedding. During this ritual the father of the bride puts his daughters hand on to the groom’s hand. It signifies the beginning of a new journey for the bride. From that moment onwards the bride belongs to her in-laws and now it’s their responsibility to take care of her. Mangal sutra – It is the holy thread that is tied on to the bride’s neck. It’s made up of gold and black beads. And the pendent is usually made up of diamond encrusted gold. It’s the mark of married Hindu women. Bidaai -it is the final ritual of the wedding where the bride goes to her in-laws place, accompanied by one of her family member. This marks the beginning of her journey in her new house. Muhurat is very important aspect of an Indian wedding traditions everything from the time the barat enters, to the bidaai has to be done on time. These muhurat is found by the astrologers and priests and they make sure that all the rituals take place within that time frame. The timings are considered to be auspicious so one has to do things within the muhurat. Muhurat is not just confined to marriages it is followed doe may other auspicious occasion as well. At bride’s in-laws place, some fun games are also played, these games are an integral part of the Indian wedding traditions. It’s played to engage the couple in activities and to get to know everyone in a better and relaxed environment. The next day after a small puja, the bride comes back to her father’s place and stay there for a day. This tradition is there in almost all Indian cultures where the bride comes back to her home after wedding. Indian weddings also have themes. You can find lots of colors in traditional Hindu wedding as well as Muslim weddings. You can see light tones in Indian Christian weddings. Thus the decorations are done according to the theme. These rituals might differ but the Indian wedding traditions and values haven’t changed for centuries.